Summer can get tricky when there are two working parents in a family. Many children here leave town for a good part of three months to spend time with grandparents at the sea, in the mountains or in the country, while parents or fathers stay in town to work. Grandparents here are a very popular form of free 24/7 year round babysitting and nobody seems to think much of packing off multiple children to their elderly parents, who take care of them without a complaint for months on end. Our parents don't do the 24/7 thing, whether for health reasons, distance or simply because hello, they have their own lives + should enjoy their golden years and their grandchildrens' occasional presence + spoil them rotten and leave the dirty task of parenting to the parents already! As much as we would ideally love for the abovementioned to kidnap our kids for weeks on end and free us of the worry of how to organize yet another summer in the city and enjoy multiple dates on week nights, we are realistic and totally believe that it is wrong and should not be. To be truthful, things have luckily been changing noticeably in the past years, with August no longer being that month where everything is closed in the city (no tumbleweed rolling down the streets anymore!) and more and more women working alongside their spouses. The city and schools offer summer acitivities for children all through August, something quite unheard of until recently. If you ask me, July and August have almost become pleasant, relaxing months to be in Milan, this summer in particular, where the weather has been extraordinarily good and cool. We almost feel priviledged to be here. There are however a couple of factors to deal with, no matter how well you actually know you are coping. The first one is that atavic, irrational feeling of guilt all parents live with, or at least all working mothers (yeah, sure, it makes us more accomplished women, better moms blablabla but truth be told, most of us don't really have a choice anyway). And then there is the fact that I (as also my husband) was a priviledged child who travelled and spent several months away from home every summer (chaperoned by a balanced mix of grandmothers, nannies and parents). As a result, to compensate, we have been away pretty much every weekend this summer, trying to give our kids concentrated shots of the seaside, the mountains and the country. We have been alternating these short trips with some stints away for our oldest with F's family. The little one is still too small and too much work. Luckily he doesn't understand yet and still prefers being with Mommy and Daddy for now. The result is short weeks, where Thursday has become Packing Evening (I never cease to be surprised at the amount of things you need to take for the under-6 category, even for just 2 days) and Monday has become Unpacking/ Laundry Evening. This means very little time to cook and even less time for foodshopping (thus an empty fridge). This is where a pasta like this comes in handy. All pantry staples except for some fresh peppers, which you can pick up at any corner supermarket. Not bad, eh? 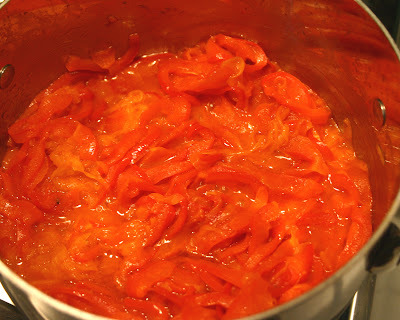 It is very quick and so flavorful it will make your taste buds sing. Go on, make it tonight. Tomorrow is Packing Night again. Recipe adapted from here, a wonderful source for many tasty recipes. Slice the shallots and peppers quite thin (and mince the garlic if you want to add some, I didn't) and heat in a pot adding in the diluted tomato puree. Cover and cook until soft on a medium to low flame. 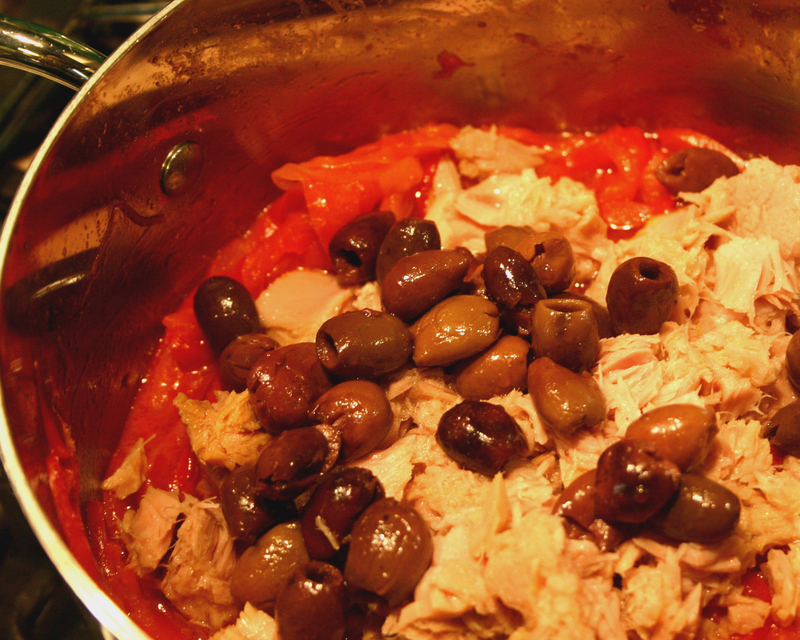 In the meantime prepare the other ingredients, chopping the olives if you want to and draining the tuna from its oil. Uncover the pot, add in a dash of olive oil and let cook on a medium flame for a few minutes. Add the tuna and olives (and capers if you are so inclined. I was out of them and am not a huge fan anyway) and cook a little longer. Add some water if too dry. Drain the spaghetti and mix in the sauce. In Greece it's exactly like that; grandparents take the kids for three months to their summer houses while parents stay back in the city to work. For me it was like that. Three whole months of vacation near the sea! Going away every weekend is great but that packing/unpacking thing sounds like a nightmare! Great looking pasta dish. I love the simplicity of it and of course the Mediterranean touch! Olives & tuna are a surefire way to make any quick meal pack a punch, and they're both so perfect with a light tomato pasta. This looks great, and is an inspiration for those rushed weeknight dinners when everything has to come together right quick! MyLEK - it sounds like you had happy summers as a child. I would find it difficult to be apart from my kids for so long, but even just a few days totally alone with my husband doesn't sound bad. Meister - the peppers add just the right balance. I can relate ; my mother did not want baby-sitting duties and my mother-in-law was busy starting her own business. This pasta is great and I will make it like, in the next couple of days!!!! This looks like a great pantry staple! :D You know I wonder how my parents did it! My parents are both very busy...so I know it will be harder for them to watch any of their future grandkids than some of their friends. My dad owns and runs his own business still. He's seventy! But anyway...thank you for sharing this with me, my friend. I'm sorry I've been so absent lately. This pasta looks delicious. ToB - And I am sure your kids turned out wonderfully anyway. Lorraine - in the end it is just a matter of fitting in all the pieces, like doing a puzzle. Sophia - hehe, I hadn't even considered the child's view of getting a break for parents. Although that will probably come later. Peggy - it really has turned out to be a lovely summer. Monet - I hope to be like your dad when I am his age. It all works out in the end, as long as there is love. Aarthi - thanks for dropping by. Will be happy to visit your blog. The one thing I can't get The Hungry One to eat is tinned fish. But I think if there's one recipe that could turn him, it's this. Thank you! I love recipes like this where everything is a pantry ingredient. It makes life so much easier when you are feeling a bit harried. This looks great and I love the strong flavours. 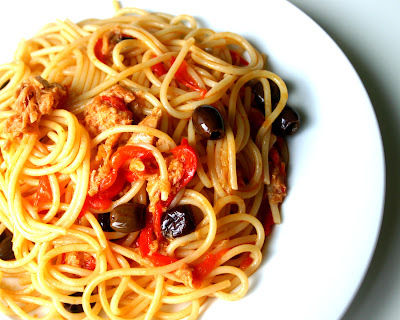 I love pantry pastas; pasta is such a great quick meal,and olives, peppers, and tuna are a great flavor combo. Tori - this could be the recipe, I agree. The flavor combination is just so addictive. HH - yeah, addictive as I said above. BbyN - hi! I agree. The pepper keeps it feeling fresh and healthy despite all the pantry items. Manu - will send you the material. I agree about the kids. It is difficult to keep them busy in the summer, but even more difficult to part from them. I find that 3 months summer vacation is an exaggeration to begin with, but that is opening a whole new can of worms. Hope Vic is better. Ciao cara! Many memories of being in a little island in Italy and eating fresh made canned tuna. If you know how to do it? would you like to tell us how? Thank you for blogging always lovely recipes. Hi Rosequist, I unfortunately do not know how to can tuna. I am glad you enjoy the blog. Ciao! Indeed, you touched one of the most disconcerting Italian habits in this post! I have always wondered how I would cope with it and always laugh at my colleagues that complain about UK's "long" summer breaks... Anyway you are right, I think August is way the best month to be in Milan. It is no longer unbearably hot, usually, and the city is for a change a little less crowded. Gazpacho - a soup or a drink?